Coconut may not play a big role in your grilling, but in Asia it is a staple. Malaysians, Cambodians, and Indonesians all use coconut shell charcoal for grilling. Coconut milk goes into marinades and basting mixtures in these countries: try the Cambodian coconut grilled corn in Planet Barbecue. In Guam, freshly grated coconut is added to grilled chicken salad. So as you ascend the ladder of barbecue enlightenment, you need to know more about the amazing coconut. Happily, Ramin Ganeshram is here to help you. Ramin is a journalist, chef, and cookbook author known for her expertise in the cuisine of Trinidad and Tobago. Here are some indispensable tips from her handsome new cookbook, Cooking with Coconut in our store. The coconut, which is native to tropical climates like that of Trinidad, grows on the coconut palm tree, which bears fruit year-round. Its ready availability makes it a staple ingredient in the cuisines of South Asia, the Caribbean, and Southeast Asia, where it is used in rice, curries, and soups as well as sweets. Thanks to my dad, and our family visits to Trinidad, I learned early on that a coconut starts as a large green nut filled with liquid and a thick jelly. As the coconut matures and dries out, the jelly becomes the hard white flesh that my friends back home thought was the sum total of the fruit (if they even knew what real coconut looked like at all). It’s only when the green casing is cracked open that the brown shell is revealed, complete with the raffia-like threads that we see on coconuts in the supermarket. Today coconut is no longer exotic and rare. My specialized knowledge of the fruit I love so well isn’t nearly so unusual or strange. Instead, coconut has become a mainstream flavor and, in many cases, a go-to ingredient for healthy eaters who appreciate coconut’s nutrient density and low glycemic index, and for foodies who are eager to explore a world full of flavor. While fresh coconut was once a rarity in the supermarket, there is now a great variety of coconut products—from waters to milks, chips, shreds, sugars, oils, molasses, vinegar, flour, and more. Coconut is ideal for main dishes because its rich flavor profile allows it to stand up to any spice or base ingredient. Coconut milk is particularly useful for sauces and is often the base for Thai curries. Indeed, its flavor is mild enough that it can be used as a substitute in any dish that would normally require cream. As an addition to breading, grated coconut gives fried foods a multidimensional, slightly sweet flavor profile that adds a level of balance to spicy, salty, or sour ingredients. I find that coconut nectar is an ideal glazing ingredient, while coconut sugar is an excellent ingredient to round out rubs for grilled or charred meats. 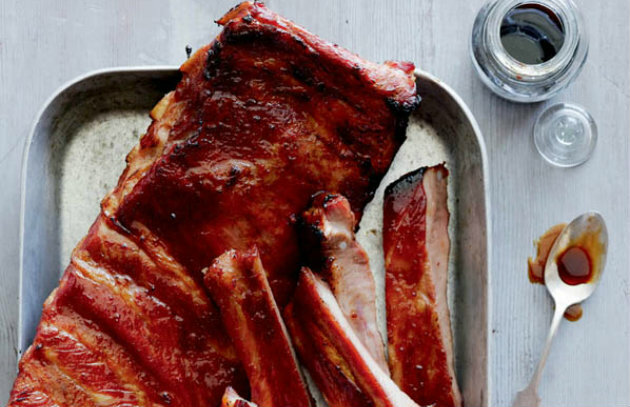 Give it a try on your grill this weekend—Ramin’s recipe for Coconut Spareribs is available here. 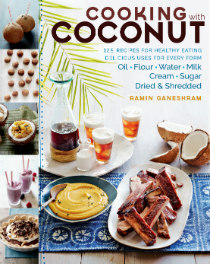 Excerpted from Cooking with Coconut by Ramin Ganeshram (Storey Publishing). Copyright © 2016. Photograph © Matt Armendariz.